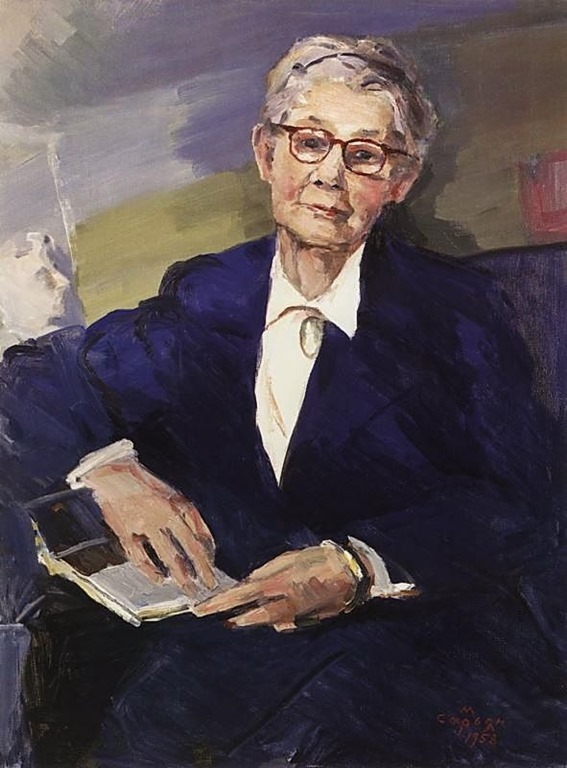 Lydia Durnovo was a Soviet Russian art historian and restorer, considered one of the founders of the school of art historians in Armenia. She was born in Smolensk (Russia) on May 1, 1885. She first attended a local gymnasium, where she studied drawing. She moved to St. Petersburg in 1904 and entered A. V. Makovsky’s art workshop. However, she only studied for a year. The Russo-Japanese war of 1904-1905 had started, and she left for the front to serve as a nurse. She returned to St. Petersburg in 1906 and she graduated from the school of the Society for the Encouragement of Arts in 1915. She would subsequently complete her postgraduate studies at the State Institute of Art History and the Archaeology Institute between 1920 and 1923. In the 1920s Durnovo worked as a research fellow at the Institute, specializing in early Russian art. She was also the assistant curator of the Russian Museum and headed its copy shop, gathering and training a group of enthusiasts, who became the core of a school of restorers and copyists. In an early wave of repression, she was arrested in October 1933 for allegedly being an “active member of a counterrevolutionary fascist organization.” She was deported to Siberia and eventually freed three years later, in November 1936. In 1937 Ruben Drampian (founder and first director of the National Gallery of Armenia from 1935-1951), invited Durnovo to move to Armenia. The Gallery had created a department of Medieval Art, and it was necessary to establish the gathering and storage of manuscripts on a scholarly basis, as well as to organize the systematic copying of art works. She gathered again young students and taught them how to restore and copy works of art. After two years of contract work, she became a permanent employee of the Gallery in 1939. Coming into contact with the architecture, frescoes, and miniatures of Armenia, Durnovo was among the first to look at them from the standpoint of an art historian. Scholars like Garegin Hovsepian, Toros Toramanian, Josef Strzygowski, and Nikolai Marr had contributed valuable historical and philological studies to the field, but Armenian medieval art was looking for a researcher who offered an aesthetic response. The study of Armenian monumental painting, namely, frescoes, was Lydia Durnovo’s significant contribution. She discovered and studied unknown frescoes, and refuted Austrian art scholar Strzygowski’s view that medieval Armenia did not know them. She dated, organized, and copied Armenian frescoes, as well as miniatures. She also made an important contribution to the study and copying of drapery. By the mid-1950s, Durnovo had earned authoritative reputation in the field of Armenian medieval art. In 1952 she published the album Armenian Ancient Miniature, which became a landmark in the scholarly life of Armenia and was published in eight languages from 1952 to 1969 (English edition, Armenian Miniatures, New York, 1961). Three years later, she left her work at the National Gallery and became a researcher at the Art Institute of the Armenian Academy of Sciences. She supervised the restoration of the frescoes of the Cathedral of Holy Etchmiadzin. Three years after Stalin’s death, she was rehabilitated by the Soviet government and the charges leveled at her in the 1930s were suppressed. In 1957 she published a second book, A Brief History of Old Armenian Painting. After a prolific career and contribution to the study of Armenian art during a quarter of a century, Lydia Durnovo passed away in Yerevan on January 7, 1963.